Knoydart Studio room with one of the best hot tub views in Scotland, is a stunning private self contained studio room with romantic canopied bed, private wc and kitchenette located on the remote Knoydart Peninsula overlooking Loch Nevis (Gaelic for Heaven). Featured in Conde Nast and Sky Travel Channel as a remote luxury bolthole with one of the best hot tub views in Scotland. Underfloor heating Wifi, Bose sound dock, smart freesat panasonic tv, large outdoor hot tub. 1 well behaved dog welcome. Go fungi foraging, crabbing, lobster potting, hill walking, climbing, beach walks & island hopping to Skye & Small Isles. Local fast water taxis run daily. Share the decking with otters at breakfast, mackerel fishing, watch the dolphins in the bay or go whale watching out in the Sound, with no light pollution experience the Milky Way for the first time! Visit the Old Forge remotest pub in mainland Britain – great for seafood, real ales or a nightcap! There are some great local dining out options close by and we are surrounded by three munros over 3,500 feet high with Ladheir Bheinn the most westernly munro on our doorstep. The perfect spoil and quickest relax at Knoydart House Studio Room. Hi, my name is Jackie Robertson. I run Knoydart House Studio Room and Hide our smaller luxury hideaway for couples, both offer something very very special. Remote luxury self catering for families and friends in our larger property Knoydart House or for 2 people in our new luxury let Knoydart Hide on the beautiful Knoydart Peninsula. We have 2 children, are pet friendly (well behaved pets) and enjoy sharing Knoydart House and Hide with families with children as well as couples in love who want to unwind and enjoy the unspoiled beauty of the rough bounds of Knoydart Peninsula. Our lifestyle is very different, being accessible only by boat Knoydart offers a true escape, 15 minute by boat off the beaten track. Although boat access only, Knoydart is a bustling little village with pottery tea room. post office, seafood pub and restaurant for great reconnection time with those that matter the most. Knoydart is a fantastic place to bring up children, the lochs are bursting with scallops and razor fish, fresh mussels, lobsters crabs, mackerel and creel langoustines. Folk music figures highly. Go wild swimming in our clear crystal river, relax by a waterfall, go sealife spotting for whales, orca, minke, porpoise, stag, deer, otter or sea eagle. We have lived here on Knoydart for 20 years, it is known as the last wilderness and is a stunning location. Having run mainland Britain's remotest pub The Old Forge for 20+ years and recently sold it we bought the land where we built Knoydart House and then last year Knoydart Hide. The location overlooks Loch Nevis, sealoch Gaelic for heaven set in under an acre of private woodland with uninterrupted views across the loch. The spot where we built Knoydart House was first claimed by our young Children aged 10 and 12 for their den and made way for our larger development of our new eco house. There is no light pollution on Knoydart, you can watch otters feast at dawn from the decking, the boats come and go across the loch and observe the milky way for the first time! Knoydart has no roads in, boat access only and is a great family and friends castaway destination. 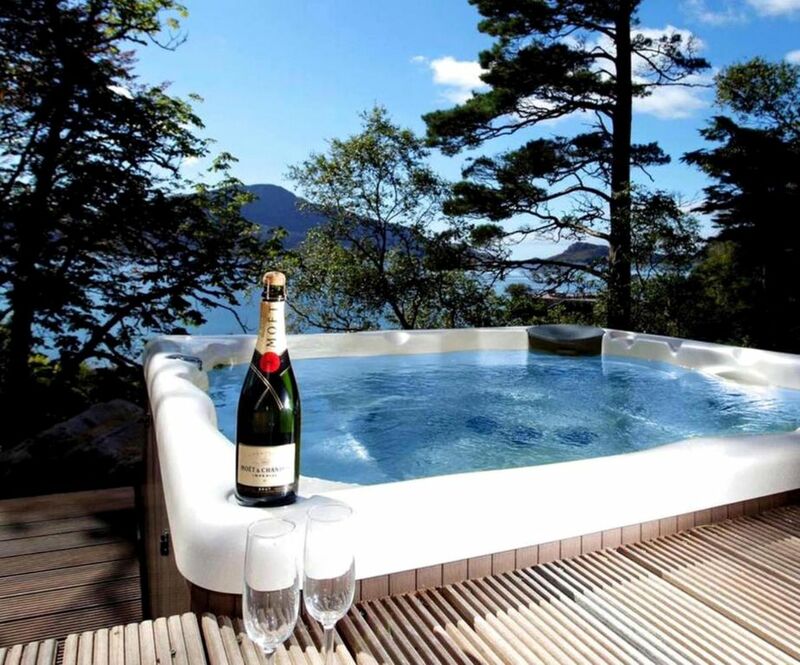 Knoydart House has featured on Sky Travel Channel described as having one of the best sealoch hot tub views in Scotland. The Studio Room has wi and DVD player. There is a BOSE blue tooth wifi connection sound dock for your iphone or ipods. Underfloor heating. Although a more unspoiled location Knoydart really has something for everyone, the walking is out of this world 3 munros on our doorsteps, complete privacy yet only 5 mins walk to the pub, village, tearoom pottery and pier. Mackerel fishing, crabbing, ceilidhs and the best seafood on our doorstep. Relax under the nightsky and watch the milky way with a glass of bubbles in the hot tub or watch the boats slip their moorings and dine alfresco breakfast with the stags, otters and porpoise at play in the loch. The Studio Room is en-suite with monsoon style shower. The en-suite is supplied with Scottish Organic lemongrass and Ginger hand dispensing soap, shampoo conditioner and body wash for our use and an eco half flush toilet. underfoor heating throughout via sustainable air source heat pump. crisp white linens, hot tub towels and towels provided. hot tub towels and towels provided. yes fridge and separate additional freezer outside the property for your use. Panasonic breadmaker Nespresso coffee machine induction hob microwave etc fully equipped kitchen. Studio Room is open plan all self contained and has a small bistro style dining table and two chairs for guests. A handpicked selection of Scottish interest, scottish cookery books and Conde Naste and Red monthly magazines for light reading too. 5 mins walk to pier from house, we meet all guests on arrival with a vehicle and trailer to make for a relaxing start and end to your stay. Skiing is available on Aaonch Mhor Fort William, 1 hour by car from Mallaig. There is a small golf course at Arisaig, 15 minute by car from Mallaig. Notes on accommodation: The accommodation is furnished to a superb high level. The property also has a large outdoor hot tub which is sunk into the decking and floodlit. Outside: Landscaped with grassed area to the sides of the property set in under an acre of private woodland with stunning uninterrupted views across the loch, this waterside property has wraparound decking, floodlit with large hot tub for your use. The studio room is completely self contained from the rest of the property so you will enjoy uninterrupted privacy and you have exclusive use of the hot tub between 10 amd 10pm during your stay with us. one pet welcome on request. Utility Room: Washing machine, tumble dryer. Covered outside area for wet gear. Cleaning / Towels / Linen / Luxury towels, quality white crisp cotton linens. Electricity included. Knoydart has some great low level walks and beach strolls for all ages. Knoydart House is situated approx 70 metres from the beach overlooking our sea loch, Loch Nevis. Less than 5 minute walk. You can watch the otters at dawn and the porpoise out in the bay from Knoydart House Studio Room..
Take the A830 'Road to the Isles' from Fort William. Best to allow yourself 1-1 and ½ hours from Fort William to Mallaig. 3 ½ - 4 hrs from Glasgow or Edinburgh to Fort William. 2 - 2 ½ hours from Inverness to Fort William. Harry Potter fans see the viaduct bridge made famous on the Hogwarts Express/flying car chase at Glenfinnan monument. Pass the white sands of Morar, made famous as the beach locations for Local hero with Burt Lancaster. Direct Sleepers from London, Glasgow and Edinburgh. All trains / sleepers go to Fort William and Mallaig via Glasgow train station. Sleeper direct from London. Knoydart local cars and Knoydart House guests can park up cars safely in the car park in Mallaig, situated on the left before you go through the main roundabout entering Mallaig. Local ferry and water taxis depart daily 15 min crossing. They are very comfortable, sail in all weathers across a sheltered sealoch and are very safe. Several sailings a day, we are happy to arrange for you. We have the most amazing fresh shellfish landing daily. Mallaig is home to several fish merchants who can arrange fresh langoustines, John Dory, scallops, mussels, haddock, oysters etc for your holiday stay. During the week they will arrange pre-ordered fish to Knoydart on the ferry by arrangement as will the local Co-op just ask us at time of booking for information and we will assist you. There are excellent water safaris to rum eigg and the small isles, or go whale watching with our wildlife operators, see minke whales and orca, porpoise, dolphin and seabirds in their natural habitat. Boat charters direct from Knoydart. The house is 5 mins from the pier. Local fast water taxis cross our sheltered sealoch (20mins) up to seven sailings a day seven days a week. Visit Gavin Maxwell's museum, see Eilan Donan Castle in Skye by boat, climb munros or simply relax. Knoydart offers something for everyone of all ages. We offer a personal collection service of all guests and their luggage when arriving and departing Knoydart House Studio Room, with a landrover and trailer on the pier. The house is only 5 mins from the pier but you are on holiday after all!